Japanese school uniforms are interesting because they are quite different from the standard school uniform of Western schools. If you have every watched anime you may have some idea already, but for all else this is an interesting look into a part of Japan they may not often get a chance to see. The traditional style school uniform is based on military uniforms from old Europe. Both male and female versions are very common in anime, very often worn by the “bad” kids (yankees), so you may recognize them easily. The high-necked standing collar male uniform is called a gakuran (gah-ku-rahn) and is based on 19th century Prussian army uniforms. Once upon a time it featured a hat, but nowadays usually only grade schoolers wear the hat. More on that below. The sailor suit, the female school uniform, is based on the old British navy uniforms. Unlike the gakuran which is pretty consistent from school to school, the sailor suit can be slightly different at each school. At present many schools are switching to a more Western style. I suppose—and my wife agrees—this could be because of the miitary asscioations with the traditional Japanese school uniforms. But I don't know for sure, nor do any of the school administrators I asked. Go figure. 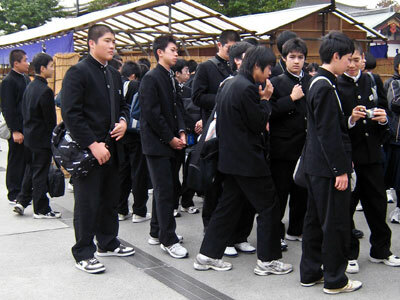 For guys, the Western version of the school uniform is pretty straight forward. Usually white shirt, slacks, a tie and blazer. And for girls, your basic white blouse, dark skirt and blazer. There are two dates everyone in Japan knows. These are June 1st and October 1st. What important event takes place on these days? None other than the seasonal uniform switch! There are two basic versions of the Japanese school uniforms, one for summer and one for winter. As you might expect, the main difference is the winter version is heaver and warmer. It might also feature a slightly different color or design for girls, but this varies by school. Funny thing about the seasonal switch is they never change despite the actual weather. Many years1 it is still pretty warm when Oct 1st rolls around, but this is when the schedule says we change to winter wear, so by God, we will. And it’s the same for summer. By the time June 1st gets here, the kids are really suffering in their winter suits and are really happy to change to summer uniforms! This has also worked it’s way into the culture and affects peoples’ attitudes. To many Japanese, when the schools change to winter uniform, it’s a sign that winter is right around the bend and signals that it’s time to change out the clothes in their own closets. The above uniforms are what you will find in many middle and high schools. 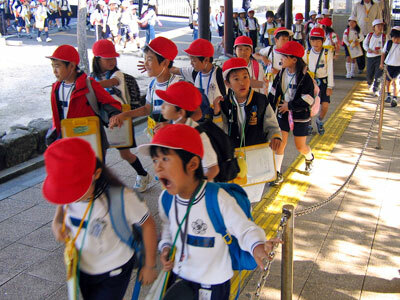 Japanese school uniforms for Elementary schools can be a little different. The rules are looser and it varies a lot from school to school. Most common is probably casual clothes with a bright hat, usually yellow or orange. The bright hat is simply so cars can easily see them when they walk to school. Yeah, in Japan most elementary school kids still walk to school alone. Other schools may make it more formal and require some kind of standard uniform. These can range from versions of the sailor suit and gakuran to just white shirt, black pants/skirt. Although the trend is away from this to a more casual dress. This is more of a girl thing—as far as I know, anyways. Since the female uniform can vary in design from school to school, many girls pick the school they want to be accepted at solely based on how “cute” the school’s uniform is. Weird, huh? Watching how the kids try to rebel against the system is kind of interesting. Girls tend to wear huge baggy socks, called loose socks. This is actually probably the image most people have of schoolgirl Japanese school uniforms. I’m told by my students here in Okazaki that baggy socks are no longer cool, but I still see them all over when I go to Nagoya and even in Tokyo. Maybe it's a big city thing. Also common is to sew decals into their regular socks, wear huge very colorful barrettes and they make their skirt as short as possible. Boys who wear the Western school uniform rebel by wearing as bold a shirt as possible under their white shirt, bold or with crazy pictures or words, all of which obviously show through and are intended to do so. If they wear ties, a current trend is to wear their tie knot as loose as possible and the shirt unbuttoned. Many also roll their slacks up to the knees or farther. Amazingly, most don’t clean up their appearance when they actually get to school. My wife tells me that these rebellious ways to wear the uniforms continue in all the classes. One final thing, it is very common for girls to wear their uniform all the time, even when they aren’t in school. It’s cute, remember, and they picked their school solely based on the uniform, so they wear it as much as they can. And that, my friends, is all you need to know about Japanese school uniforms! All of the years I’ve been in Japan, anyways, and according to my wife most of the years of her childhood, too! Return from "Japanese School Uniforms" to "Japanese Culture"